The TARDIS unexpectedly materialises inside one of the rings surrounding the planet Saturn, after it detects a hole in time. With the TARDIS refusing to move, the crew are saved by a girl and a Glaswegian AI robot called MMAC. They are brought to the nearby Mnemosyene Cincture, a station orbiting one of Saturn's moons. The station, known as the wheel of ice, is home to a colony of people who have been tasked with retrieving the rare mineral, Bernalium, from the icy moon below them. The concept of this story is fantastic, it is a world of messy, frontier space mining, which gives us something much more fresh than the usual space-station stories we are given on television. The Doctor, rather amusingly, mentions that cramped space-stations remind him of a camping holiday he once took in Wales. There is a story I would like to read! Touring the station, the Doctor and his friends discover that things aren't right, equipment is being sabotaged and of course, they are accused of being the saboteurs. But there is also political stirrings going on as a hard-working mayor is trying to make life fair for her people who are all trapped under the thumb of the Bootstrap Mining Consortium. Baxter manages to capture the chemistry between Jamie, Zoe and the Doctor brilliantly, giving them all dialogue which sounds authentic and sounds like something these characters would say. Baxter also gives Zoe plenty to do, playing on her scientific backgrounds, something which the show could forget to do. Jamie gets most of the action to himself, as he finds a role with the younger members of the colony, becoming a figure that they can look up too. The only problem with Jamie in this book is that he is too-Scottish, his lines are hard to read sometimes, though its not something compared to the indecipherable dialogue giving to MMAC. The main alien threat comes from an alien intelligence, what is good is that the threat is shared with the readers much longer before it is to the characters in the book. The backstory for the intelligence is dripped in throughout the book, through a series of interludes which build up as a alternative perspective of the events. This narrative trick is very clever as it allows the reader to be one step ahead of the Doctor, as well as allowing the author to introduce the concept allohistorical lore, this being an object sent back through time to tweak history, allowing a certain event to be altered. With humanity being involved though the real threat comes from inside, but the human villain is a little too arch and unconvincing at times. The novel is littered with little nods to other Doctor Who stories, it mentions Mars Probes from The Ambassadors of Death, and the T-Mat, from The Seeds of Death. It is obvious that Baxter knows his Doctor Who and even throws in little mentions of Li-H'sen Chang, from The Talons of Weng-Chiang to the novel, Black Orchid, from the television story, Black Orchid. Attracting authors like Stephen Baxter, Jenny Colgan and Michael Moorcock is an excellent way to make sure the classic series continues in modern times. 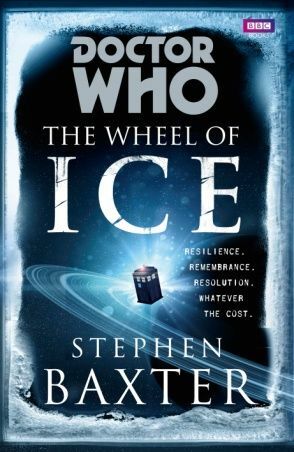 The Wheel of Ice is a story that couldn't be created on television nowadays, let alone in the 1960's, it is so full of wild ideas and imagery!